With this update you can specifically tailor a portrait phone view of your existing dashboard as part of the dashboard authoring experience. 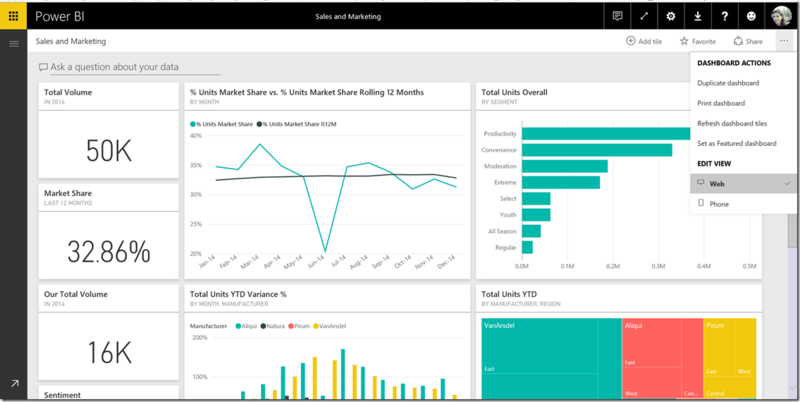 Once you finish creating your dashboard in the Power BI service, you can use the dashboard settings to optimize how you view it on your phone. Permissions to change the phone view are only available to dashboard owners. Changing the default phone view will not affect the web, tablet, or phone landscape views of that dashboard. Changes will only be applied to the dashboard when viewing it on the phone in portrait mode. In the phone view editor, you can unpin tiles, resize and re-order them as you’d like. As you edit the phone-optimized view, your dashboard viewers will immediately get the updated experience on their iPhones, Android, and Windows phones.